Wednesday November 30th 1892 I was at home all day. The weather was dark and gloomy. I sewed what time I could spare from the house work. Thursday December 1st 1892 I was at home all day and put in my spare time sewing. The girls gave Ott a surprise party for his birthday. We had a pleasant time. he is 33 years old. Friday December 2nd 1892 I was busy about the work all morning. Will and I went to town in the afternoon and over to inquire about Mrs Halson. She has met with a sad accident in breaking her leg. I did some sewing in the evening. Saturday December 3rd 1892 I was at home all day busy with the work. weather brighter once more. Will and I spent the evening over at Woolfs. Sunday December 4th 1892 I was busy with the house work till after dinner. Will and I went over to Marys and from there to town to invite company for tomorrow night. The folks were all over from town. Willie Clute called in the afternoon. Brown and Mills in the evening. Monday Decmeber 5th 1892 I was busy with the work all day. I cleaned up the parlor and [hurried?] it up as I had company invited for supper. Dr Kessler & wife, Mr Couflin & wife, Charlie Hedges and wife. The weather was not good but they came and we had a very pleasant time. Tuesday December 6th 1892 It was a damp foggy day. I helped with the work, hemmed a dozen napkins. called down to see Mrs Galloway and Mother called over at Mrs Sorters. I knit in the evening. Wednesday December 7th 1892 We washed in the forenoon and I went over to the church in the afternoon. I did some errand about town and come home in a snow storm. I did not see the girls. 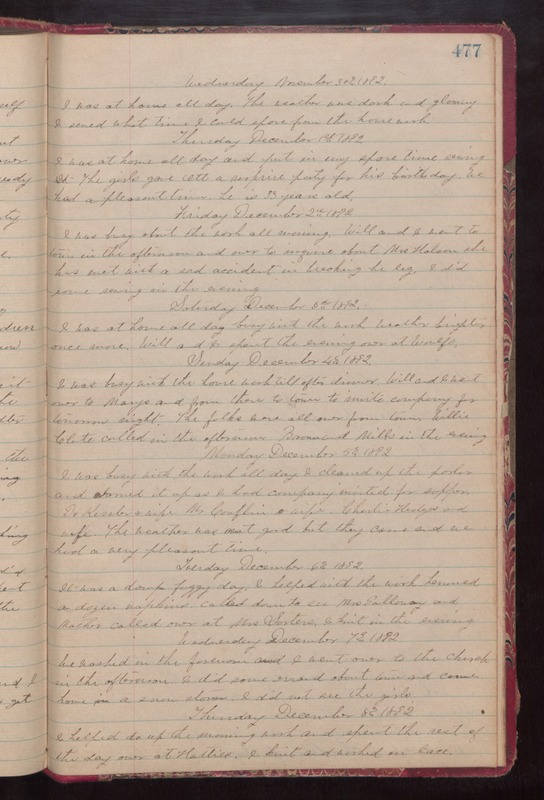 Thursday December 8th 1892 I helped do up the morning work and spent the rest of the day over at Hattie. I knit and worked on lace.